The 420 Tractor came set up just about any way a buyer wanted it. In fact, there were so many 420 conformations that the advertising literature of the day referred to the “420 fleet” rather than a single model. There was a 420 General-Purpose Tractor with a dual-wheel tricycle front-end, another essentially the same with a single-wheel front end, a third with wide-axle front end. There was a 420 Standard. There was a 420 Hi-Crop with 32 inches of under-axle clearance, and a 420 Special with 27-inch clearance over the row and a wide range of wheel spacings. 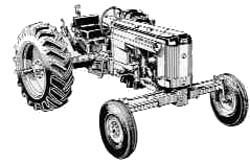 There were two 420 Utility models, one which straddled and cultivated two rows, another with a low profile for grove, orchard, and vineyard work. Finally, their were two 420 Crawler options, one with a 4-roller track system, the other with five rollers to provide maximum flotation, traction and fore-and-aft stability. The 420 was rated at 20.31. drawbar hp and 24.83 belt hp.